In this article I want to examine the design of an indicator called the Sequential Exhaustion. 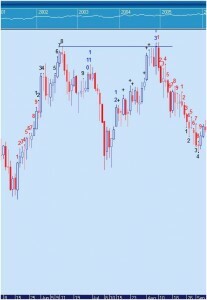 The Sequential Exhaustion Indicator is based on the methodology of Thomas Demark. Thomas Demark is considered to be one of the great market technicians of the world. A trader for over 38 years, Thomas Demark has authored three books which have all become trading classics, the Sequential Exhaustion Indicator is described in detail in “The New Science of Technical !nalysis”. 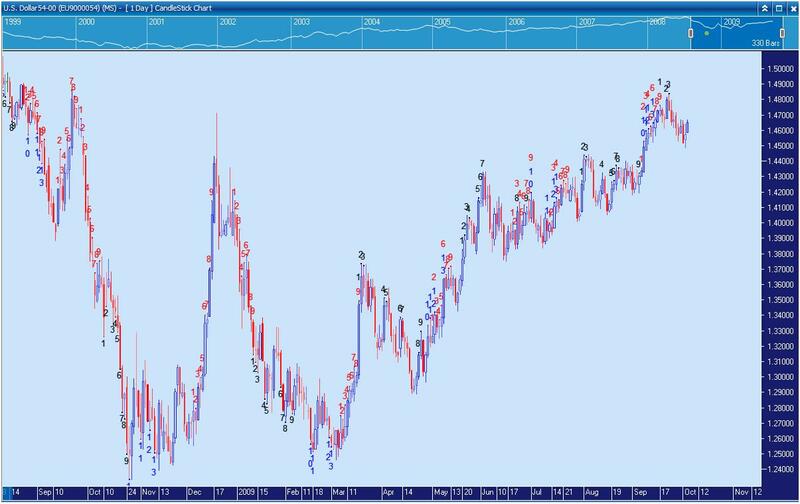 Demark’s favourite quote is that “the trend is your friend unless it is about to change”. 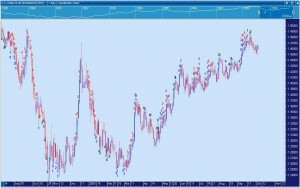 The Sequential Indicator was created by Demark in the mid 70’s before charting software was available to traders. The purpose of its design was to help him locate high probability zones where the prevailing trend was likely to end. 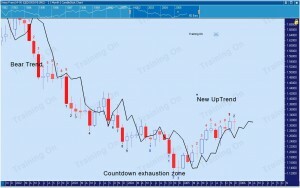 There are two key components that make up the Sequential Exhaustion indicator. 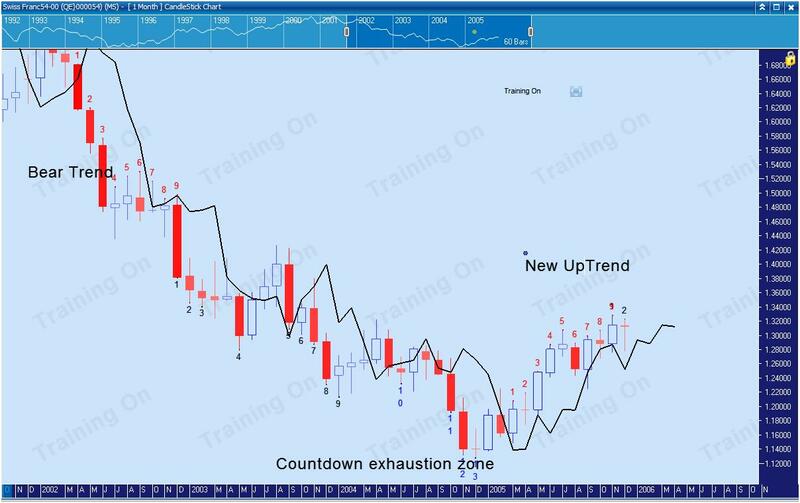 As the tool is trying to identify the exhaustion of a trend, there must firstly be a trend before there can be any exhaustion of this trend.Therefore the first component of the Sequential Exhaustion Indicator is that it has a trend identification method, and once the trend is identified, the exhaustion process can then initiated. 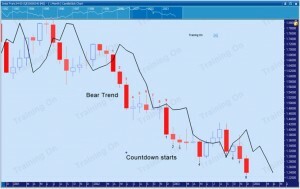 The simplest way to explain how the Demark trend is defined is to use a one period simple moving average of the close, and then offset this moving average by four bars (move the Moving Average four bars to the right). See image. Notice that when the market is trading in a sideways motion, the bars can jump above and then below this offset one period Moving Average within a very short period of time, without any sustained momentum. 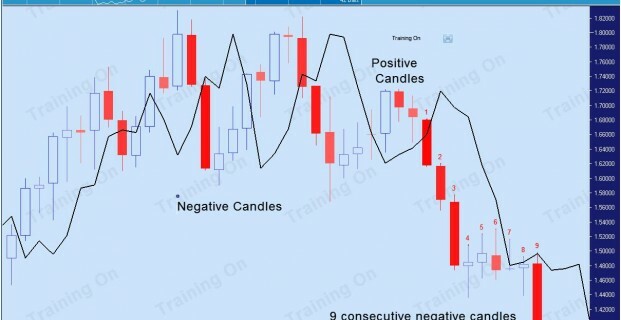 For the purpose of trend identification, a close above the offset one period Moving Average will be considered as a positive bar, and a close below will be considered as a negative bar. Trends can only start if the market makes a sustained consecutive nine bar move above or below this offset one period Moving Average. This trend identification process is always an ongoing process. Once a trend has been indentified, the numbers one through to nine will be labelled as red trend numbers by Market Analyst. 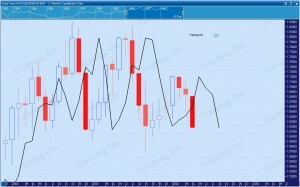 In the above example, the close of all of the bars are below the offset one period Moving Average. This is obviously signalling a bearish move. 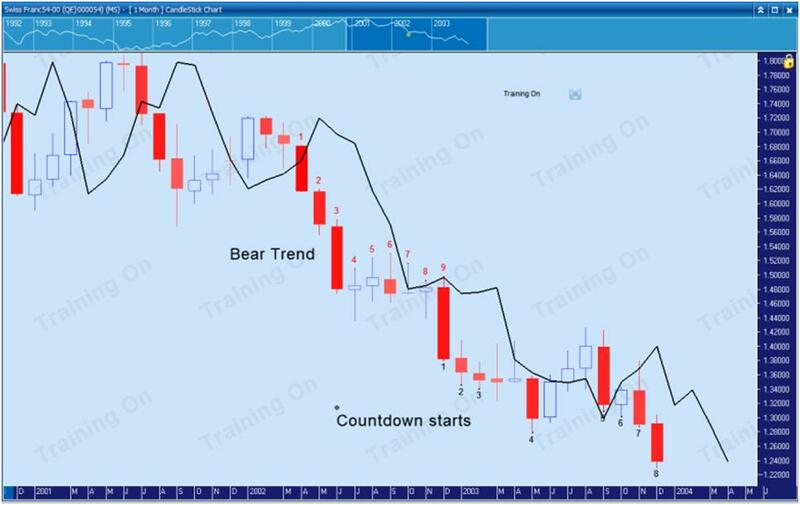 The Countdown process can only start from trend candle 9. 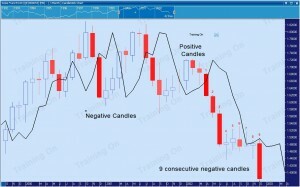 The Countdown candle must close beyond the look-back of 2 candles (Lower for a bearish market, higher for a bullish market). 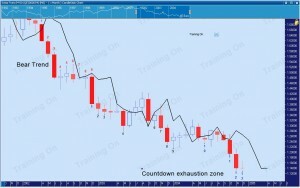 The Countdown process is the second component of the Sequential Exhaustion Indicator. 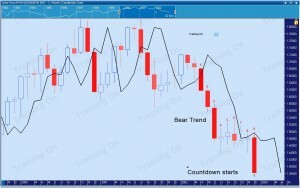 In this case, the close of trend bar nine is lower than the low of look-back 2 bars, and therefore this bar is the first countdown bar in the exhaustion zone. Market Analyst will display countdown bar as black numbers. 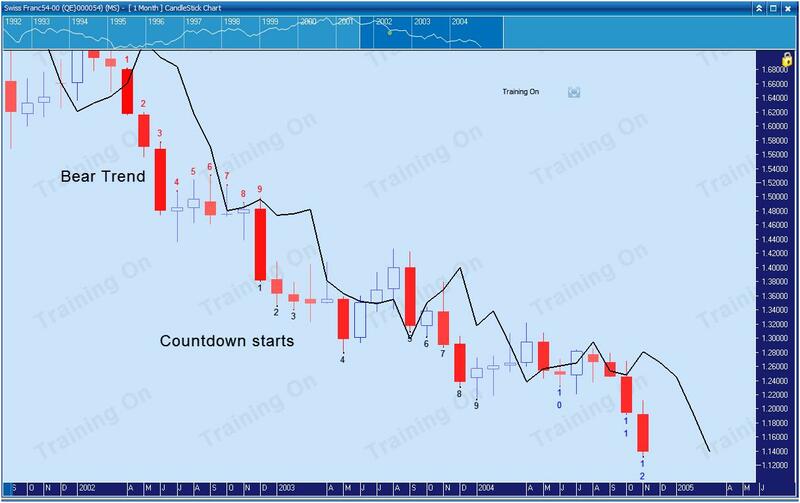 Note that countdown bars may not occur continuously, as the market may go into minor corrections and therefore delay the exhaustion. The Countdown continues only if the rule for the countdown is met. The close of countdown bar number eight has special significance, as this level provides an additional filter rule that will define the final exhaustion bar. 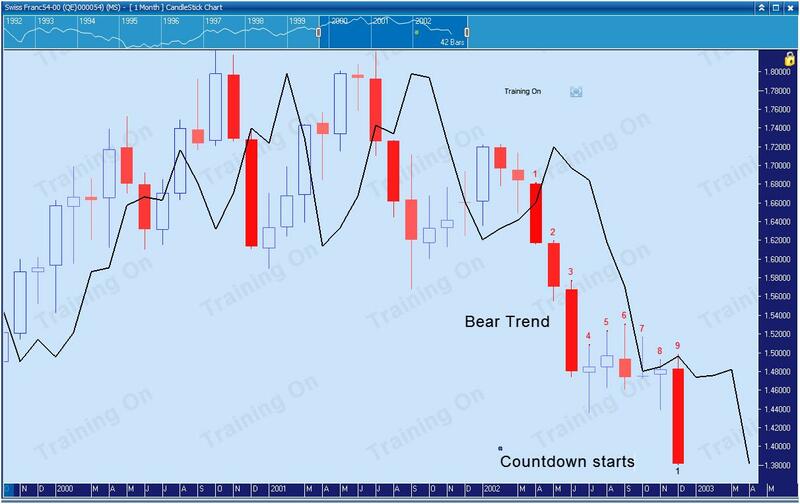 Market Analyst will remember the close of Countdown bar 8 and will apply the rule at the exhaustion countdown bar. This is being described below. 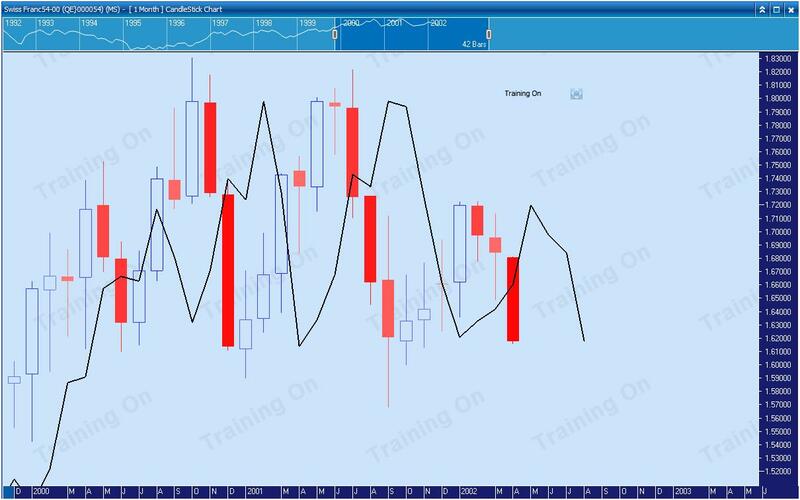 Notice that Market Analyst will colour code exhaustion bars 10, 11 and 12 in blue. This means that the countdown process is now deemed to be approaching an exhaustion zone. The final exhaustion bar is countdown 13. The rule is that countdown 13 must be beyond the close of Countdown 8. In a downtrend as in our example, countdown 13 must not only be a valid countdown candle, but must also be below the close of Countdown 8. If this requirement is not met, Market Analyst will notate any countdown candle after countdown 12 as a +. 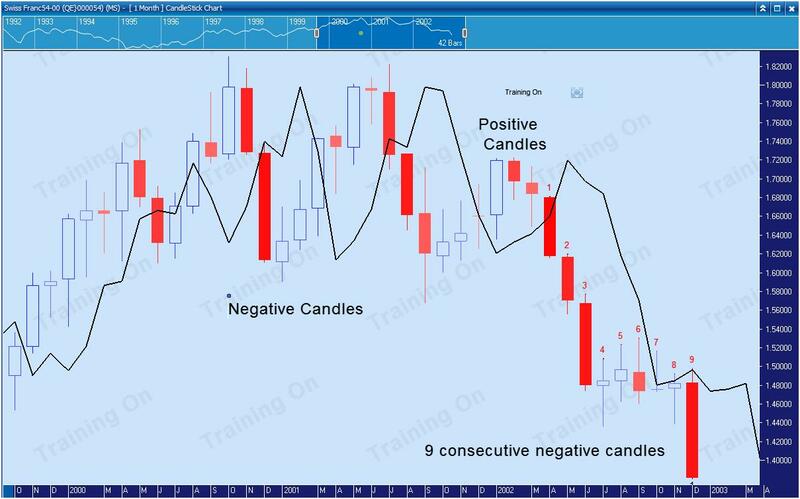 This means that although the candle is a valid countdown, it is not the Exhaustion Countdown 13. 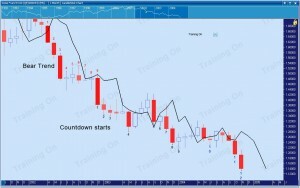 In the current example, the next countdown candle met the exhaustion rule, and is then labelled as countdown 13, also in blue. Once countdown 13 appears, the market is deemed to have reach a level whereby the sellers are exhausted, and the new bullish trend can soon start. The above chart shows two exhaustion zones that correctly anticipated the lows in the EUR/USD. 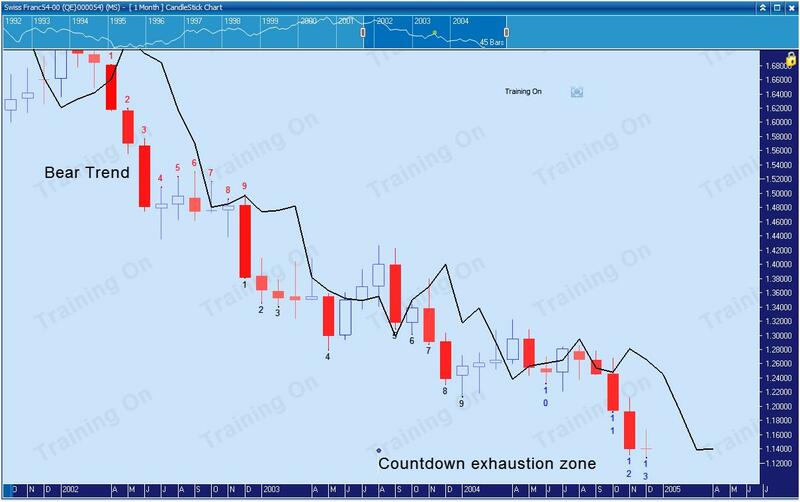 There are further complexities in understanding and using the Sequential Exhaustion Indicator. There are also some books and authors who have done a fine job in the interpretation of Demark’s methods. 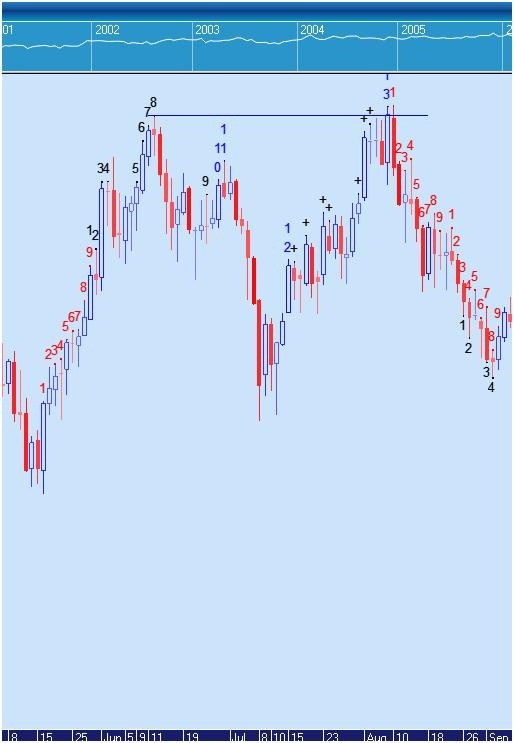 It would be advantageous to do further research for yourself on this tool and Demark’s methods, as this is just an introduction to the Sequential Exhaustion Indicator. However I hope that by providing you with an insight into how the tool was designed, you can see the potential usefulness that this tool could have for you. I have used this tool with great success over many years in my own trading, and teach this tool as part of an overall trading strategy for my students.